Let’s Eat Outdoors – A masterpiece. 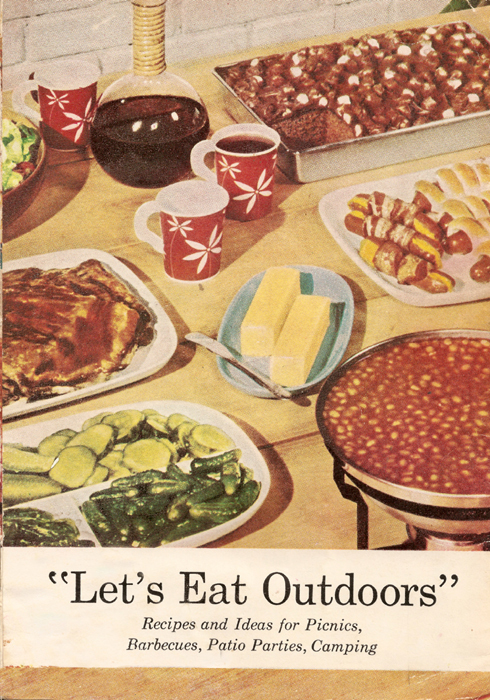 Not your average cookout cookbook, “Let’s Eat Outdoors” is a mid-century fantasy of outdoor eating from the rugged to the refined. Look for some of the bluest blue chips of packaged goods brands and some of the most clever and creative recipes – all set against a backdrop of first-rate ’50s advertising design and copy. Publication date: mid-1950s. Tired of the same-old burgers, dogs and occasional steak on the BBQ? 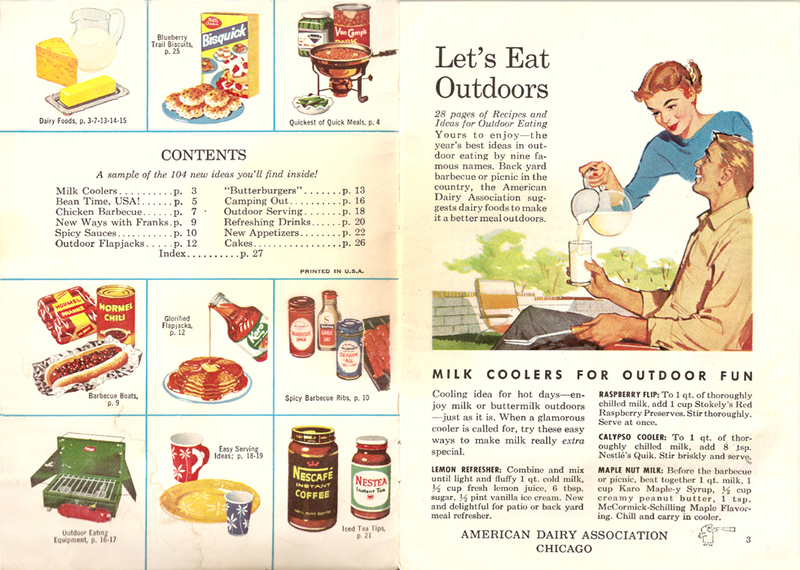 Follow the recipes in this fine booklet from the American Dairy Association for a remarkable outdoor dining experience. 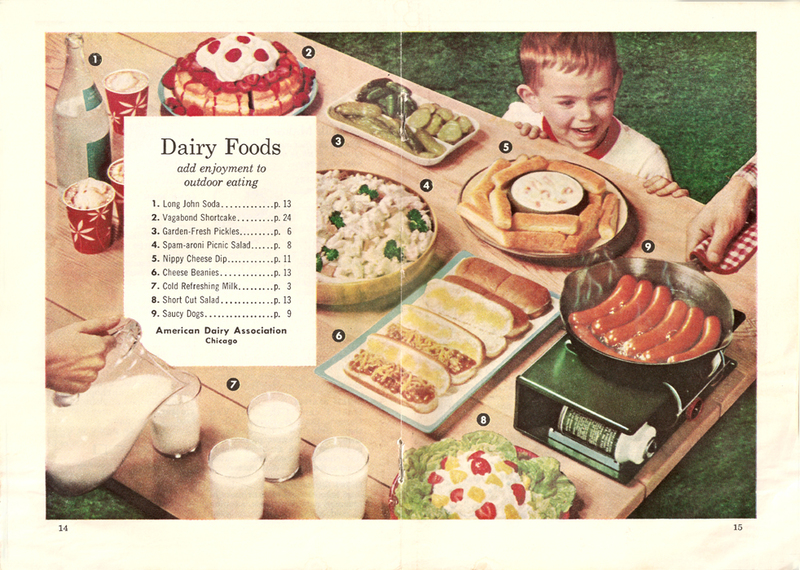 First off, you may be puzzled by why the America Dairy Association would sponsor a cookout book as milk is not widely recognized as a barbeque-friendly beverage. But put that thought aside and revel in the truly odd mixed milk drink concoctions and a marvelous menu of great grillin’ and “go-withs” from the Goliaths of the grocery store. 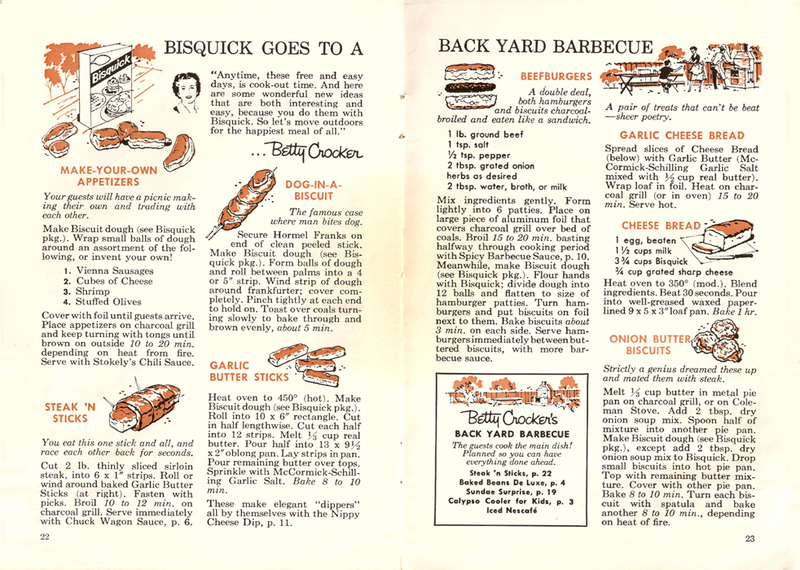 Look for some outrageous recipes from Hormel, Van Camp’s, Bisquick and Spam…yes, SPAM. 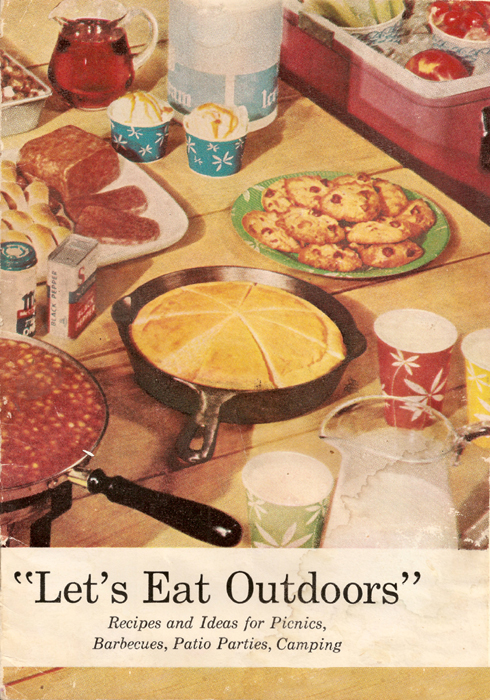 Also includes outdoor cooking suggestions from Coleman because when you’re camping every meal is a cook out. Be it a Barbeque, Picnic, Patio Party or Campout, it’s doubtful that a Milk Cooler will add to your outdoor fun. Possibly quite the opposite. And what’s up with buttermilk as a beverage? Glamorous? I’d say gut wrenching. But don’t let the milky missteps turn you off of this wacky pamphlet. You’ll find a lineup of recipes that will have you eating outdoors 24/7/365. And in this heat, pour me another Lemon Refresher…this time with buttermilk! Recipes: Lemon Refresher; Raspberry Flip; Calypso Cooler; Maple Nut Milk. 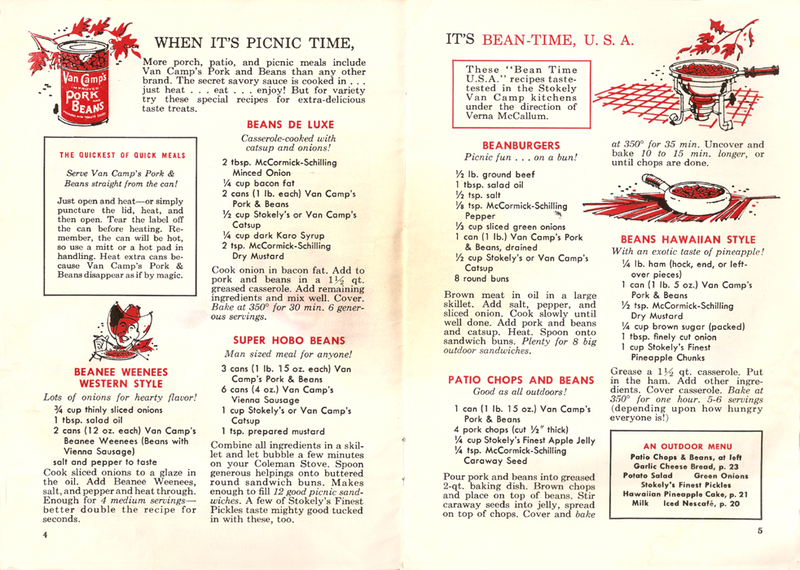 My instinct would have been to lead with the meat, but in “Let’s Eat Outdoors,” it’s always BEAN TIME, USA! 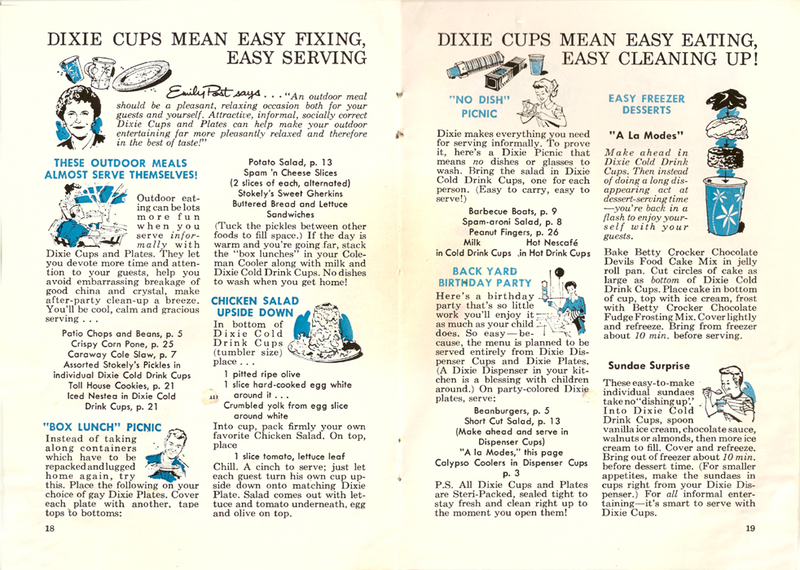 Oddly, the box on the right hand page suggest you just dispense with the recipes and dispense Van Camp’s beanly goodness right from the can. But you’d prove yourself a fool if you passed up on Beans De Luxe, Beanee Weenees Western Style and the favorite of Clark Kent’s n’er-do-well vagabond brother…Super Hobo Beans. Other recipes include Beanburgers, Patio Chops and Beans and the fabled Polynesian delight, Beans Hawaiian Style. Pickles = More Picnic pleasure. Don’t you forget that…ever. After a tuna salad only remarkable for the inclusion of a 1/2 cup of pecans, the attention turns to SALADettes? 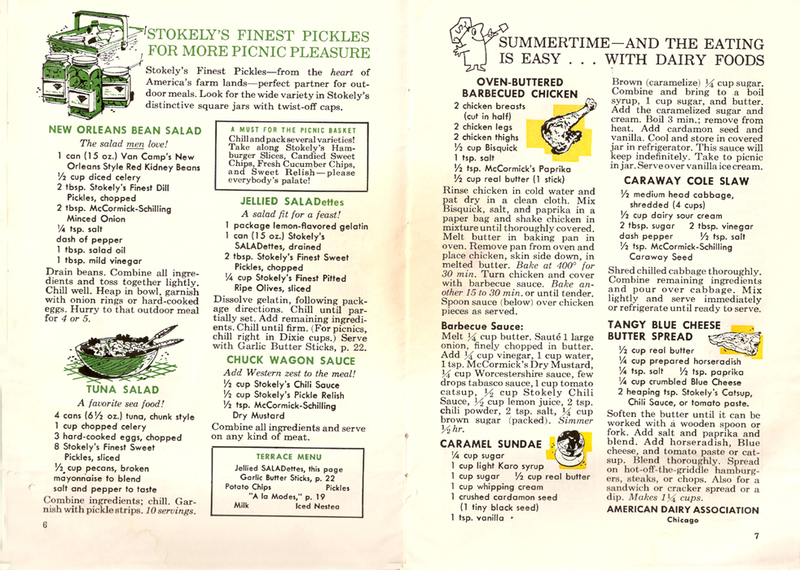 Stokely’s Saladettes seem to be a discontinued product (from a discontinued brand). I’m still not sure if they were small pickles, or a pickled version of the “saladette” variety of tomatoes. Either way, anything in a Jello® mold other than Jello seems strange and off-putting to the 21st century palette. 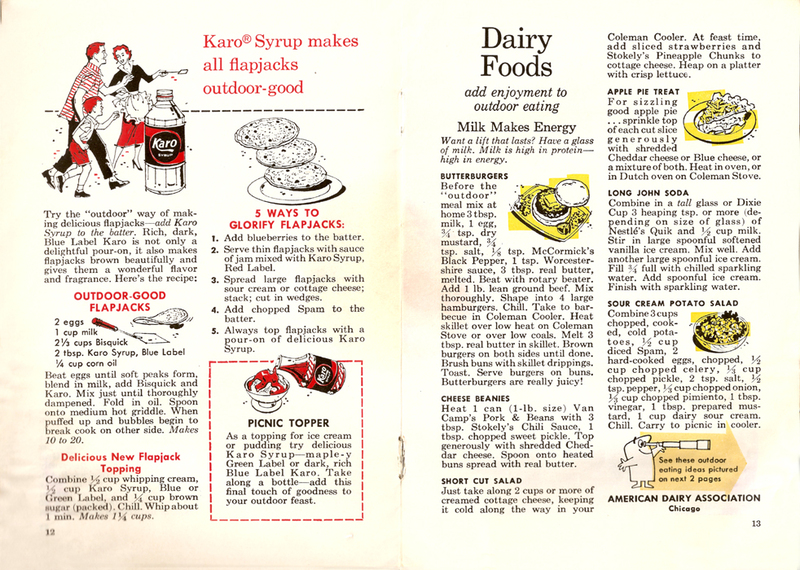 On the left hand page, a small, somewhat undefined chef extols the virtues of dairy foods as a cornerstone of easy summer eating. Other recipes: Chuck Wagon Sauce; Oven Buttered Barbequed Chicken, Caramel Sundae, Caraway Seed Cole Slaw and Tangy Blue Cheese Butter Spread. The Yankees had Murderers Row, Notre Dame had the four horseman, Cincinnati had the Big Red Machine. Mere amateurs. 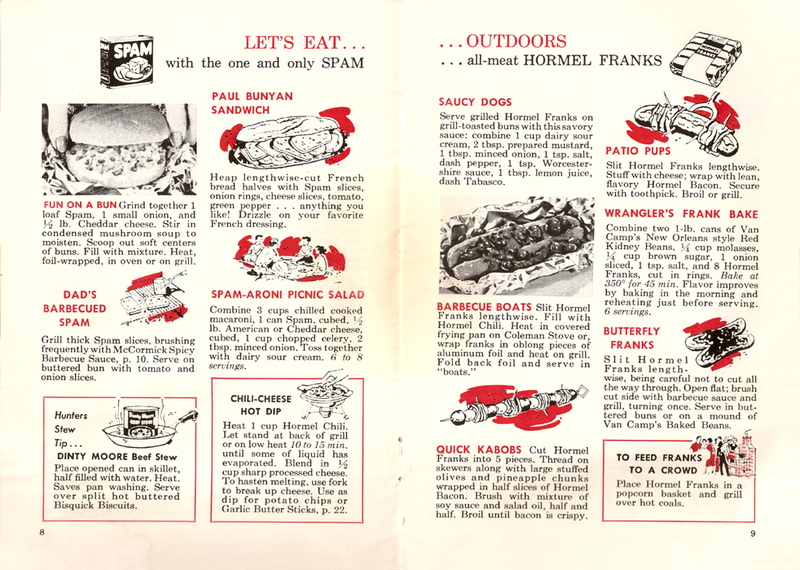 Let’s Eat Outdoors has the one and only SPAM and all-meat Hormel Franks. The result is an unstoppable lineup of outdoor recipes: a virtual hall of fame of cookout creativity and eating excitement. These recipes deliver a home run combination of clever naming, innovative technique and dazzling presentation. This is Man food in its purest form. 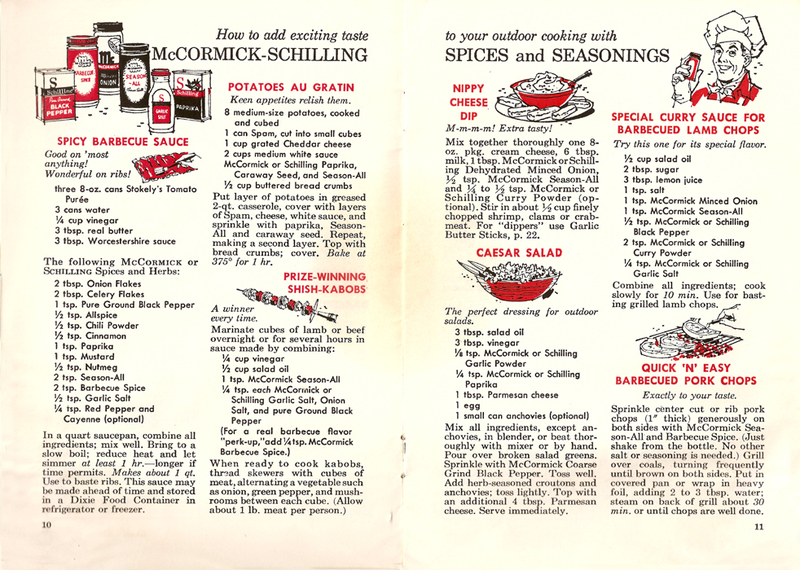 If you disagree because the recipes require a modicum of preparation, check out the guest appearance of Dinty Moore which is simply cooked right in the can. Read every recipe on this page carefully and then try to pick just one favorite…it’s impossible. If you were stranded on a desert island with only one set of ingredients, this is the set of foodstuffs to choose. And maybe that DishTV package that includes every NFL game. And a do-it-yourself angioplasty kit. Recipes: Fun on a Bun; Dad’s Barbequed Spam; Hunter’s Stew with Dinty Moore; Paul Bunyan Sandwich; Spam-Aroni Picnic Salad; Chili-Cheese Hot Dip, Saucy Dogs; Barbeque Boats; Quick Kabobs; Patio Pups; Wrangler’s Frank Bake; Butterfly Franks; Hormel Franks in a Popcorn Basket. Man cannot live by Spam (and Hormel all-beef franks) alone. These pages include some recipes featuring real-meats as designed by nature, not food scientists. Well, mostly…the Potatoes Au Gratin includes one can of Spam. The Barbeque Sauce is intriguing with a baker’s dozen of individual spice recipes. It’s your call on whether you want to go through the trouble of mixing it up when you can find probably 50 superior barbeque sauces in even a second-rate grocery story. You’ll also find a generally authentic Caesar Salad recipe, only with McCormick garlic powder instead of fresh garlic. Recipes: Spicy Barbeque Sauce; Potatoes Au Gratin; Prize-Winning Shish-Kabobs; Nippy Cheese Dip; Caesar Salad: Special Curry Sauce for Barbequed Lamb Chops; Quick ‘N’ Easy Barbequed Pork Chops. Glorifying flapjacks with liberal quantities of corn syrup seems strange to the 21st century reader. Sort of like those appalling ’50s ads with doctors recommending a particular brand of cigarette. But make no mistake Karo Syrup is NOT the same as high fructose corn syrup (HFCS). HFCS is today’s dietary public enemy number one, thought to cause obesity, diabetes and a host of other serious maladies. Some say it’s why people don’t user their turn signals anymore. Anyhow, Karo Syrup is made with a different process and contains mostly “good” glucose rather than “bad” fructose sugar compounds. Karo Syrup harkens back to a gentler time when you cold pour it on and in any breakfast or desert without the guilt. We then transition to Dairy foods, but if the title didn’t tell you we’re talking dairy, you’d hardly know it. But Dairy is the focus of the left hand page. Sure, butter is the gimmick in Butterburgers, but beef is the star. The Apple Pie Treat is also interesting in that it suggests crumbled blue cheese to this old-time New England favorite. Recipes: Outdoor Good Flapjacks; Delicious New Flapjack Topping; 5 Ways to Glorify Flapjacks; Picnic Topper; Butterburgers; Cheese Beanies; Short Cut Salad; Apple Pie Treat; Sour Cream Potato Salad. 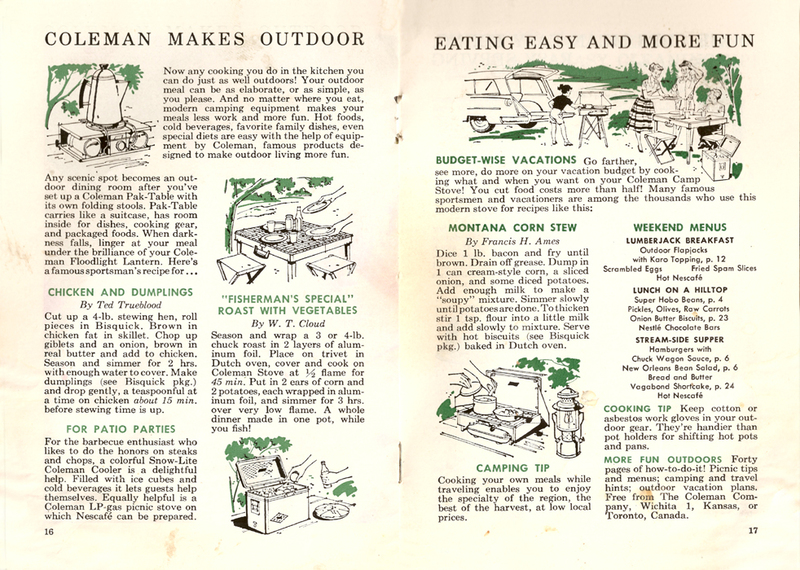 As much as the Coleman stove can provide a wealth of humor, we’ll focus on the Chicken and Dumpling recipe which seems strangely out of place in a booklet of flashy, Spammy recipes created by marketing folks who wouldn’t be caught dead eating them. You read it and it has a real and honest quality about it. Like a recipe a real outdoorsman would suggest while sitting around a campfire. 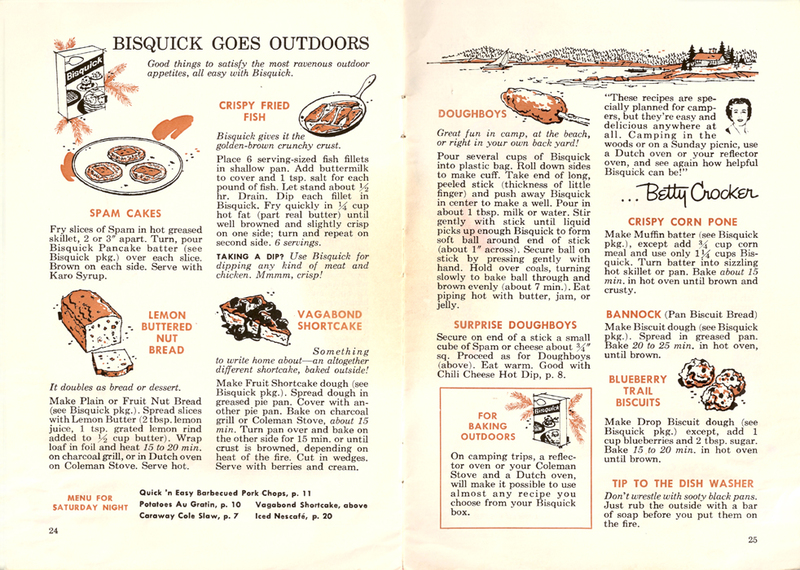 And indeed, the author of the recipe, Ted Trueblood, was one of the first conservationists as well as a noted writer on all things outdoors. Read more here. Field & Stream magazine still lists him as number seven on the list of legendary fishermen (Hemingway is number eight). Recipes: Chicken And Dumplings; Fisherman’s Special; Montana Corn Stew. Recipes: Box Lunch Picnic; Chicken Salad Upside Down; A La Modes; Sundae Surprise. This ode to Nestle also showcases the subtle but effective design strategy of this booklet. Color ties into the product (as you’ll also see with other sections) and it showcases every member of the family gazing lovingly at the various Nestle products. 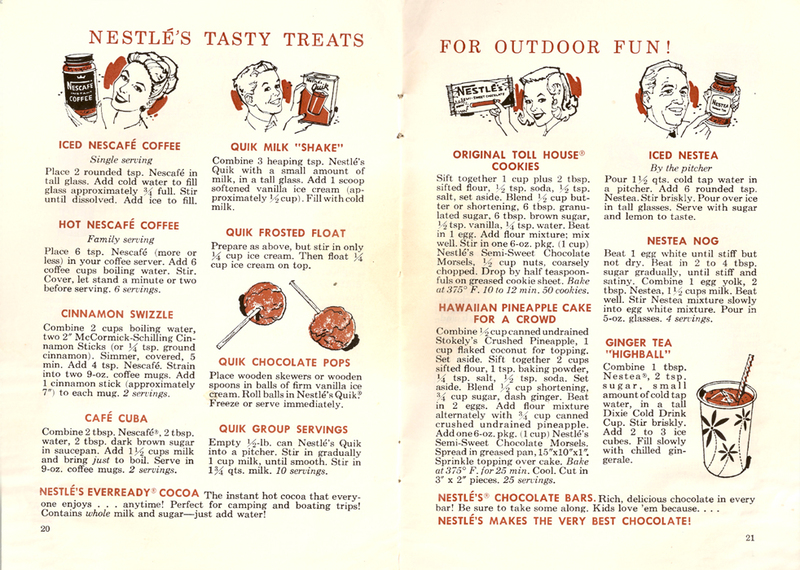 Some decent and chocolatey recipes, although the Iced Nescafe doesn’t include milk which would have made it the first documented reference to modern iced coffee. Oh well. The oddest recipe is for Nestea Nog which features instant tea as the cornerstone of a recipe including milk, whipped egg white and raw egg yoke. Again, what is this doing in a book about outdoor eating? Recipes: Spam Cakes; Lemon Buttered Nut Bread; Crispy Fried Fish; Vagabond Shortcake; Doughboys; Surprise Doughboys; Crispy Corn Pone; Bannock; Blueberry Trail Biscuits. This section provided the information we needed to date this booklet since there was no date of publication. 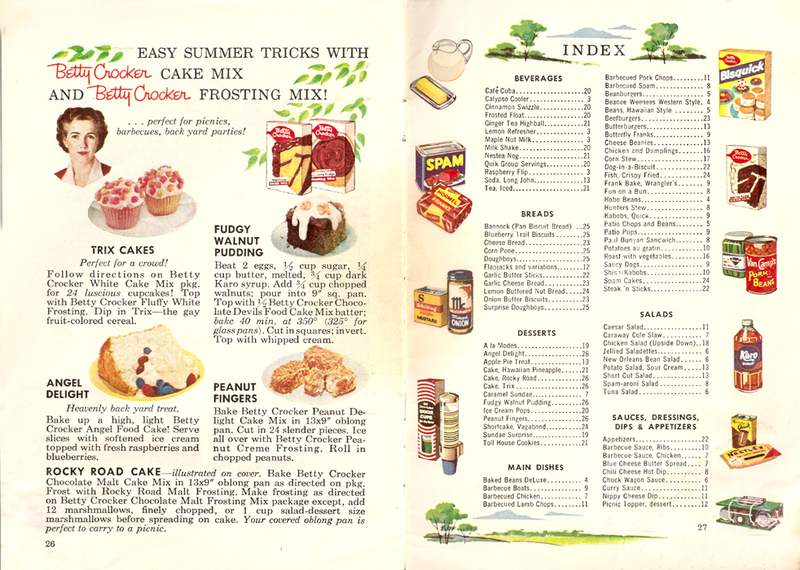 The Betty Crocker image confirms a mid-1950s data of publication. You can review the progression of Betty Crocker portraits here. The Trix Cakes are an interesting use of sugary breakfast cereal. And I’m not sure a cookout is where I’d sing for you to “bring me a Fudgy [Walnut] Pudding,” but with all the creativity in this booklet, I’m not going to quibble. Recipes: Trix Cakes; Angel Delight; Rocky Road Cake; Fudgy Walnut Pudding; Peanut Fingers. And so it ends, with a carafe of coffee, a plateful of weenies and a side of beans. The prefect menu for when you eat outdoors. Looks like some of the vintage cookbooks I have in my library!